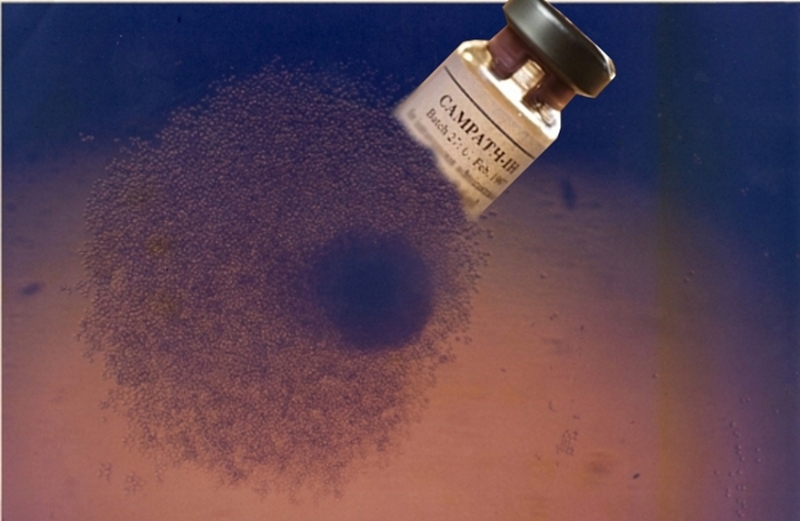 Hybridoma cell secreting monoclonal antibodies with bottle of Campath-1H. Image compiled from photos kindly supplied by Geoff Hale. Readers should note that all material contained in this exhibition is intended for use as a means to understand the complex process involved in the development of a biotechnology drug. At no point should the material be treated as a substitute for medical information and advice. Alemtuzumab is a VERY powerful drug. The drug should not be taken based on the material read here, which is not a definitive account of its benefits and side effects. This exhibition describes some individual patients' experiences. Every person is unique and individual patients respond to alemtuzumab treatment in different ways. Outcomes are influenced by many factors and may vary from patient to patient. Alemtuzumab should only be considered as a treatment option after extensive consultations between a patient and their own medical practitioners. Further information on the FDA and European regulatory approval and the clinical uses of alemtuzumab can be obtained from cancer.gov and mstrust.org.uk. Today monoclonal antibody drugs make up a third of all new medicines introduced worldwide. Six out of ten of the best selling drugs in the world are currently monoclonal antibodies. This exhibition is the story of how one specific monoclonal antibody drug, alemtuzumab (marketed as Campath, MabCampath, Campath 1H and Lemtrada), moved from the laboratory bench through to the clinic and the impact it has had on patients' lives. Just one of many hundreds of monoclonal antibodies, alemtuzumab is one of the oldest therapeutic monoclonal antibody ever created. Alemtuzumab started life, in 1979, not as a drug but as a laboratory tool for understanding why the immune system can mount an attack against foreign invaders, such as bacteria and viruses, and yet leave untouched the body's own proteins. Within a short time, however, the monoclonal antibody had transferred to the clinic, being used as a means to improve the safety of bone marrow transplants and later as a treatment for leukaemia, lymphoma, vasculitis and multiple sclerosis (MS). This exhibition offers a rare glimpse into the world behind the making of a biotechnology drug. The origins of alemtuzumab are rooted in the work of Herman Waldmann, an immunologist who in the late 1970s was based in the Department of Pathology, Cambridge University. It emerged from his hunt for a tool to investigate the mechanism behind immune tolerance. To this end he started creating a number of monoclonal antibodies. One of the monoclonal antibodies he generated was alemtuzumab. Able to target T-cells, a group of white blood cells that play a key role in cell-mediated immunity, alemtuzumab offered Waldmann not only a useful laboratory device to pursue his basic scientific research, but a means to deplete T-cells that contaminate bone marrow transplanted into patients which can cause Graft-versus-host disease, a condition that can lead to serious disability and even death. Exploring the trials and tribulations of Waldmann and his colleagues in the development of alemtuzumab, this exhibition highlights the complexity in transforming what was once a laboratory product into a drug suitable for human therapeutic use. The path that alemtuzumab took was not straightforward and subject to many twists and turns. As this exhibition shows, its journey was not only determined by scientific advances and its therapeutic efficacy. The success of the drug was also dependent on the extent to which its innovators could secure patent protection and support from pharmaceutical and biotechnology companies. Alemtuzumab was one of the first therapeutic monoclonals prioritised for commercialisation, being licensed in 1985 to Wellcome Biotech, one of the best equipped UK Biotechnology companies of the time. Its progress to the market, however, rested on the dedication of academically based researchers and clinicians, who, with only limited resources, persevered in their development of the drug in the face of dwindling industrial investment. The development of alemtuzumab also depended on the extensive co-operation and support of patients suffering debilitating and life-threatening conditions. Alemtuzumab was first approved for the American and European markets in 1991 for B-cell chronic lymphocytic leukaemia and for the European market in September 2013 for the treatment of adult patients with relapsing-remitting MS.